A statue with the power to fix your mistakes. 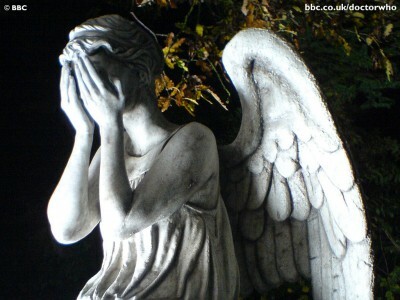 The Weeping Angel is, as the name suggests, an angel crying. Actual tears do pour forth from the eyes, and they taste sugary, like nectar. These tears flow down the cheeks of the statue and fall to the base, where a basin of sorts carved into the stone catches them. A small hole in the basin is theorized to pump the tears back up the statue to the eyes, leading credence to the theory that the Weeping Angel is nothing more than a statue that doubles as a fountain. The wings of the statue are partially folded behind its back in a sort of V shape. The entire piece is exceptionally well sculpted, though no one has been able to determine which sculptor crafted it. The feathers seemed almost real, with the individual barbs of the vanes (the bits protruding from the shaft) are able to be seen. The level of detail is extraordinary, and the person or people who made it must have put a lot of work into it. The base, however, is slightly out of place. Looking at it, one can see an almost circular crack running along about halfway between the feet and the circumference, and going through the basin. Almost circular as it does twist and turn and looks almost like a star of sorts, through it is perfect by no means. In reply, she told them that she loved a mortal who dwelled beneath the clouds. Her sisters, knowing of the man, decided to encourage her affections, so as to get their sister back. And so the angel flew down from the heavens to the man. The man returned her love and lust in a woodland glade. After they were done, the man revealed that he was married. Upon realizing that she had become a mistress, that she had been sullied, that she was impure, the angel in a fit of rage wrenched open the gates of time and returned to the past before she went down from the clouds to the earth, and stopped herself from being with the man. She regretted that decision ever since. Still bearing with her the memories of her disgrace, she weeps for what she did every after. The angel in the tale is a common subject amongst artists. Many paintings and statues dot the world, and is commonly used as a symbol for mistakes and regrets. Indeed, the Weeping Angel statue is very common, and the only things that differentiates it from the rest are the nectar tears it sheds and its location: storage at the Mausoleum of the Moon. This particular one does not have much of a history to relate, beyond gathering dust in various owner's basements. However, a small fringe group/cult fervently believes that the Tale of the Weeping Angel is true. They believe that the angel left behind some object that would grant the ability to go back in time and fix a mistake. They have scoured Atheus in search for this, and have not found a candidate that they can prove works. The Statue bears no outward signs of magic, beyond that which allows nectar caught in the basin to go back to the eyes. It does almost exaclty what the cult that seeks it wants it to: providing the power to fix a mistake. The circular/star crack permits turning the statue itself, though this defies basic geometry in any and every way, and while turning it, the statue emits no tears. For each 24th of a turn, the statue issues a click. It can only be turned 360 degrees. Each click signifies the amount of days you go back into the past. While in the past, you remember what would happened if you hadn't gone into the past. All of your actions previously are erased. For all intents and purposes, the things you did that warranted turning the Weeping Angel are erased from the timeline, and never happened. The nectar-tears are toxic. While in the past, making whatever changes to the timeline you wish, the nectar being cried by the angel does not hit the basin and thus get transported back up. No, it flows off the statue and into your own personal timeline. This is not news to be discovered by the user after they finish in the past. No, while they do what they do, they can see the Statue turning, nectar spilling off, in inconspicuous shadows in the corner of your eye. It can be said to be a haunting, creepy, and scary experience. When you emerge, you discover just how the nectar effected you. As your past actions were deleted, so too are your future ones: every so often, when you perform an action, you see out of the corner of your eye the Weeping Angel, and you are plummeted into the past just before the action was completed. The only memories of the future you have are the fact of what you just attempted to do and now must repeat (or do something else). Mechanically, I believe that having this occur 1% of the time would be good, as the typical adventurer completes actions on a common basis. I would also say that actions that need to be decided with die would be best to serve as actions that would be forced to be redone. This may mean that this curse causes bad rolls to become positive, but probability dictates that just as many good rolls will become bad, so it may not seem like much of a curse. Therefore, feel free to add another curse of your own, such as faster aging, increased muscle atrophy, etc. Keep it time-related to keep with the theme, however. Use: a nobleman wants to buy the statue from the Mausoleum, and hires the PCs to investigate it and complete the transaction. In doing so, they somehow discover its power. Enemy: before it will be owned by the Mausoleum, a villain owns the Statue and knows its power. He uses it against the PCs when they invade his castle/estate. Can the PCs triumph against someone who literally knows their every move? I would guess that he does. The attached picture has text links to the BBC and Dr. Who. a useful item with a dangerous curse for balance. I like that the user sometimes sees the angel weeping from the corner of his eyes when his future is erased. As I'm reading this, I'm curious; the more times you used the statue dose the Angel show up more often to steal your future and make you do it over again in higher percentages. (This could be based on individual uses or days of travel.) Say the villain knows your every move, but the price for him at this point is the frantic repetition of recompleting nearly every task upwards of 2-3 times. The frustration of a life like that could be unbearable. Or better yet; the over use has caused an accidental system of practice where when you're finally allowed to actually finish a project its magnificent in nature, because of all the practice. Very strong clear prose as far as I am concerned. I the drawback section though you seem to strike a very different tone and approach it with a very different perspective (second person) than the rest of the piece. It is a little jarring, and it sort of ruins the in game immersion of the piece in favor of game mechanics. Perhaps it call all be in a blockquote. Good stuff, I like the plot idea of trying to fight a villain with this. You come upon a ruined building in the back section of a city park (or other out of the way area of the city). The ruins are fairly overgrown. All that is really standing is a doorway and its frame. If you pass through the opened door, you travel to a different world. If the door closes, there may not be a doorway back to get you back.